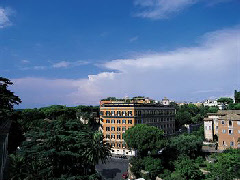 Situated in the centre of the Eternal City between the Spanish Steps and Via Veneto, The Hotel Eden was founded in 1889 by hotelier Francesco Nistelweck having originally been a private residence in the Ludovisi district. Today it is popular with the likes of Pierce Brosnan and Nicole Kidman. Both Field Marshall Montgomery and Rommel are said to have stayed at the Hotel Eden (though it’s fair to assume not simultaneously), as certainly did Ernest Hemingway. Classified as 5-star, Hotel Eden boasts well over 100 guest rooms, a bar, restaurant, and a rooftop terrace from which to survey the city below.